This stock 2007 Saturn Vue sport-utility - the last Vue built in Saturn's former manufacturing facility in Spring Hill, Tennessee - will be auctioned in Palm Beach later this week by Barrett-Jackson. This particular Vue is powered by a 2.2 Liter Ecotec engine with automatic transmission, features power windows and locks, and rides on Bridgestone Dueler H/T tires. You can bid on this Saturn, and other vehicles from General Motors' prized "Heritage Collection," by following the instructions posted on the Barrett-Jackson website. Good luck! Check out the outfits from the recent "Fashion That Drives You" episode of Project Runway. Saturn's Lisa Gilpin posted some behind-the-scenes photos showing the Saturn parts-turned-clothes, the PR set, and the after party. 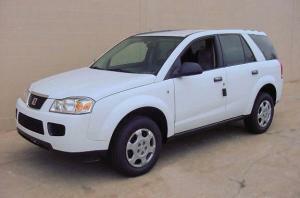 On the Auction Block: 2004 Saturn Vue "Spring Special"
There are currently 8 users and 499 guests online.